Today marks the final day of testing for the Glider, Belfast’s new high-capacity and high-frequency rapid transit service which integrates into the existing Translink bus and rail network. It also marks the first stage in delivering Translink’s new future ticketing system with off-board ticketing, another first for Northern Ireland. Later tonight, various public buildings and famous landmarks will be lit up with the same violet colour as the Glider to help mark the countdown to the new transport service for Belfast. These will include Belfast City Hall, Victoria Square, The Big Fish statue, CS Lewis Square, Culturlann McAdam Ó Fiaich and Lagan Weir footbridge. 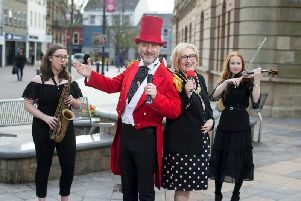 Tomorrow Belfast City Hall will see the VIP ribbon cutting and official launch of the new service followed by key stakeholders and partners stepping on board for special ceremonial journeys along the cross-city route that travels between east and west Belfast, linking into Titanic Quarter via the city centre. On Saturday, in the grounds of City Hall, an outdoor cinema event will take place as part of the countdown to the Glider’s launch. Glider has partnered with Belfast Film Festival to host an outdoor cinema event from 1pm to 8pm. The cinematic experience will screen popular feelgood movies including Disney Pixar’s superhero animation The Incredibles (1.30pm), 80s classic Big (4pm), and musical blockbuster The Greatest Showman (6pm). On Monday, the Glider will go into public service properly for the first time from 5.21am and will operating every seven-eight minutes during the day. Robin Totten, Translink’s Glider senior project manager, said: “We have trained around 60 helpers from Volunteer Now, who will be in place for the initial introduction of the service to boost passenger confidence and ensure a smooth transition to the new Glider service.